This survival knife is the ideal tool for any great outdoorsman! The rugged 8 in. stainless steel blade on this hunting knife allows you to skin game or cut through thick foliage with its saw back. Features include a compass and survival kit stashed in the storage handle. 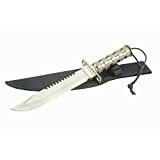 A high quality survival knife for hunters, campers and trailblazers! Complete with needle & thread, matches, safety pin, fishing hook and line. © 2019 SurivalCheap.com All rights reserved.